In the 2003 Quentin Tarantino film "Kill Bill: Vol. 1", actress Vivica A. Fox pulls a gun out of what box of cereal? 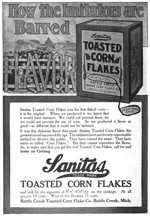 According to a 1907 print ad, "Sanitas Toasted Corn Flakes was the first flaked corn - it is the original. When we produced it, we knew that it would have imitators. We could not prevent these, for we could not prevent the use of corn. So, we produced a flavor so good - so different that it could not be imitated". In 1907, the cereal cost 10 cents at all grocers, except for those store west of the Rockies where is had a price tag of 15 cents. 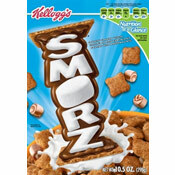 Developed by brothers, Dr. John Harvey Kellogg and Will Keith Kellogg, this cereal was introduced in 1898. The cereal was an extension of the brothers' first great cereal innovation, the wheat flake, which they'd introduced as Granose Flakes a few years earlier. Initial sales of Sanitas Toasted Corn Flakes were lackluster, thanks mostly to the fact the cereal turned rancid shortly after purchase. By 1902, the Kelloggs had reworked the recipe to overcome the spoilage problem. Sugar was also added to the flakes to boost the flavor (much to the dismay of Dr. John Kellogg who considered sugar an enemy to the human body). Sales of the reworked cereal shot through the roof. In 1903, a large ad campaign was launched under the direction Will Keith Kellogg. The cereal's popularity continued to grow. In 1906, the Battle Creek Toasted Corn Flake Company was formed. Will Keith eventually bought out most of his brother's share of the Corn Flakes Company and, in 1925, changed the name of the company to the Kellogg Company. The cereal is known today as Kellogg's Corn Flakes. What do you think of Sanitas Toasted Corn Flakes? My name is Charles R. Bolin Jr. My Great Grandfather was Charles D. who financed Kellogg. Please contact me. We have a lot to talk about. 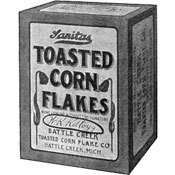 Company description -- In-between the original name "Battle Creek Corn Flake Company" (1906) and the name "Kellogg Company" (1922), there was the name 'Kellogg Toasted Corn Flake Company". This name is shown on a 1916 magazine ad in the line: "Copyright 1916, Kellogg Toasted Corn Flake Co." The brother "W.K. Kellogg" is also a prominent name in the ad and on the cereal box image.